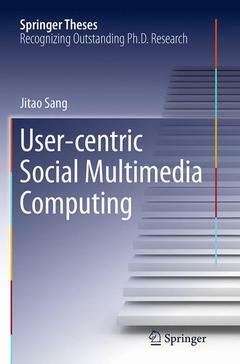 This book presents the first paradigm of social multimedia computing completely from the user perspective. Different from traditional multimedia and web multimedia computing which are content-centric, social multimedia computing rises under the participatory Web2.0 and is essentially user-centric. The goal of this book is to emphasize the user factor in facilitating effective solutions towards both multimedia content analysis, user modeling and customized user services. Advanced topics like cross-network social multimedia computing are also introduced as extensions and potential directions along this research line. 1. Introduction.- 2. User-perceptive Multimedia Content Analysis.- 3. User Modeling on Social Multimedia Activity.- 4. Personalized Multimedia Search.- 5. Cross-network Social Multimedia Computing.- 6. Conclusion.- A. Appendix. Currently Dr. Jitao Sang serves as assistant professor in Institute of Automation, Chinese Academy of Sciences (CASIA). His research interests include social media analysis, multimedia retrieval and big data mining. His recent research in user-centric social multimedia computing has attracted increasing and extensive attentions, with award-winning publications in the prestigious conferences in a very short period (best paper finalist in MM2012 and MM2013, best student paper in MMM2013). He is also the recipient of Excellent Doctoral Dissertation in CAS, Special Prize of President Scholarship in CAS.